In last week's post we determined the rally was moderating. This week we got confirmation that this is true. As can be seen, we plot six different indicators. After the past week's market action we now have three moving in a direction that indicates continued strength in the market. The other three are registering the opposite. This week we saw a clear decrease in the number of stocks trading above their 20-day and 50-day moving averages. This is a definite sign of weakness. Nevertheless, the total count of those stocks trading above these levels is still around 4000 and that is well over half of all stocks. So generally speaking, there is still a reasonable amount of broad-based strength that remains. At first glance it appears odd that the number of stocks whose 20-day moving average is above their 50-day moving average has increased again this week given what we just described in the preceding paragraph. We need to keep in mind that the moving averages lag the actual price action, hence the seeming incongruity. In the previous paragraph we discussed how the actual price had closed above or below a particular moving average. Here we are talking about how two moving averages are behaving in relation to each other. In any case, the fact that this indicator has continued to increase should be taken as a positive for now. Unless we get a good bounce in this week's trading action, though, we will probably see the number of stocks whose 20-day moving average is above their 50-day moving average begin to decline. That would definitely be of some concern. We see on the chart above that our remaining indicators are painting a mixed picture again this week. The Aroon analysis shows stocks in strong up-trends or down-trends. The chart shows the number of stocks found to be in strong up-trends has decreased slightly. However, we also see that the number of stocks determined to be in a strong down-trend has decreased. We also plot the results of Chaikin Money Flow analysis. The number of stocks undergoing strong accumulation or buying has increased from about 850 last week to about 1000 this week. Not shown on the chart is the number of stocks shown to be undergoing strong distribution or selling. This indicator has decreased after a jump last week, with the number of stocks in this category going from 580 back down to 480. 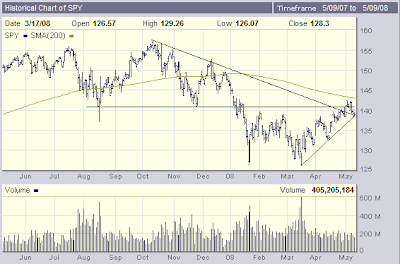 In the chart below we see that the SPDR S&P 500 ETF (SPY) has failed to break out completely but is still in the game. After breaking above resistance at 140 or so, the ETF has fallen back to under $139. The ETF got close to the 200-day moving average but didn't manage to touch it let alone break above it. Volume has been decreasing slightly even as the ETF has moved up strongly from its March low. All these are cautionary indications. On the other hand, there are two trend lines in play and the ETF has managed to stay just above both of them. Note in the chart above how the downward sloping trend line meets the upward sloping trend line just about at the point where SPY is currently sitting. The moving average analysis seems to show a market that for the short term has peaked and is retracing it earlier advance. The Aroon and DMI analysis indicates that the weakness may not be accelerating. The S&P 500 seems to be hanging in there, just barely. All in all, things are somewhat precarious but not outright bearish. We could be in a simple consolidation phase or beginning of a new trading range. This upcoming week, however, has a very full economic calendar. Now that we have laid out the technical situation, we should be prepared for the reports that are coming that could cause the market to jump or to plunge. Some of the big ones to watch out for: retail sales, CPI, initial claims, the NY Empire State Index, the Philadelphia Fed manufacturing survey, building permits and housing starts. In other words, we will get a read on consumer spending, inflation, manufacturing and housing - all the important indicators of economic health. It is likely that at least some of this week's economic reports will disappoint. So be prepared for more volatility. Until proven otherwise, though, I am sticking with my thesis that we will not be seeing a precipitous fall to the neighborhood of the January and March lows. Don't throw in the towel on this market, yet.